This Matl style Taxco treasure showcases a stunning deco elegance, boasting a vibrant blend of amethyst as well as turquoise and coral inlays – it weighs 97 grams!! The silver panels offer a half moon panel motif that has been accentuated by a beaded scroll pattern!! The silver work is comprised of a darkened finish, and the entire centerpiece measures 2 3/4″ tall x 5″ wide at its widest point. 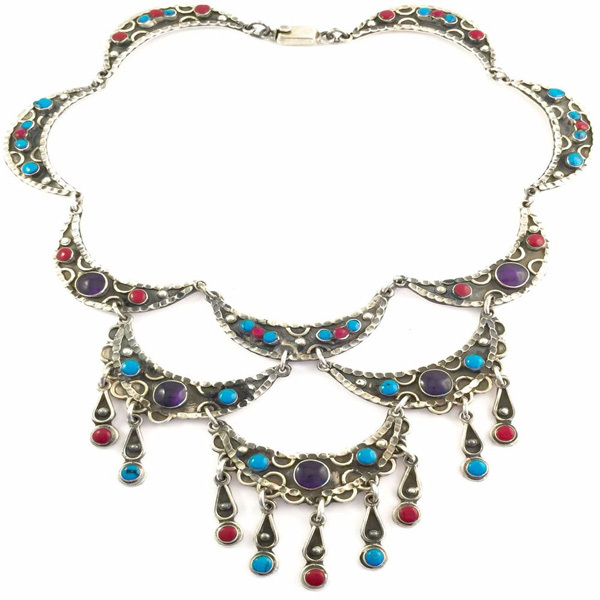 This piece offers a wearable length of approximately 16″ – exceptional artisan work! !